Uglyworld #1184 - Scottie Doggies Shortiebreaders, a photo by www.bazpics.com on Flickr. 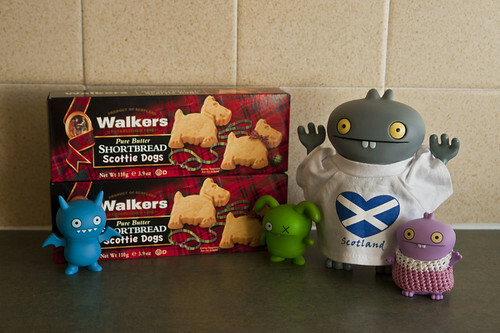 This mornings I was gettering all packered up readies to leavers Scotlands and flies back to Germanies when my Scottisher cousins surprisered me with some awesomer cookies, they is even in the shapers of Scottie Doggies, how cools is that! I am mega one hundreds percenters sures that Dug, Doug, Ralf and Rolf will lovers them!